Yacht dice game is predecessor of Yahtzee and is contemporary of another sequence dice-casting game Crag. Yacht is in public domain and similar to games such as Poker Dice, Yatzy etc. The objective of the game is to score points by rolling 5 six-sided dice and making certain combinations. 5 six-sided dice and a scoresheet. In each round all players take turn to roll 5 dice up to a maximum of 3 times. 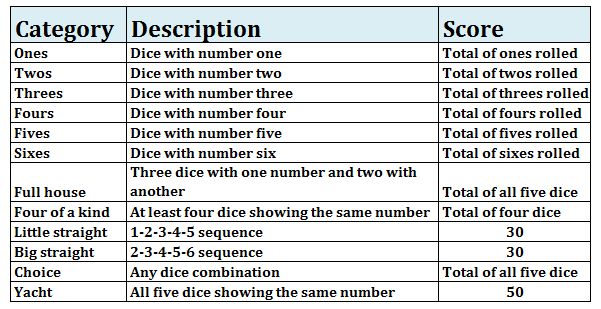 After each roll player can set aside one or more dice and then roll remaining dice. Dice which were set aside in initial rolls can be rolled again in later rolls. The game has 12 categories to score. Each category belongs to a unique combination and can be scored only once. There is no sequence in which a category is to be scored. Player can choose a category to play even if he/she scores zero in it according to the scoring rules. Sometimes it is more beneficial to score in low scoring categories such as ones or twos and try high scoring categories again in later turns if it is not achieved. Some combinations can be played in multiple categories. For example, if all five dice are showing same number, it can be scored in Four of a kind, or Full house, or Yacht. Once all categories are played, the player with highest points wins.